Yellow Foxtail. Pigeon-grass. 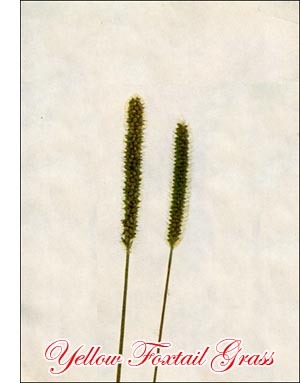 Setaria glauca (L.) Beauv. flattened. Ligule a ring of short hairs. Leaves 2'-12' long, 2"-5" wide, somewhat hairy at base. Spike (spike-like panicle) 1'-4' long, cylindrical, densely flowered, clothed in tawny yellow bristles. Spikelets 1-flowered, about 1 1/2" long, surrounded by a cluster of 5-10 upwardly barbed bristles which rise from below the base of each spikelet and exceed the spikelet in length. Scales 4; outer scales unequal; 3d scale sometimes enclosing a palet and staminate flower; flowering scale of perfect flower wrinkled, thick, and very convex. Stamens 3, purple. Stigmas purple. Cultivated ground and waste places. July to September.